Hi guys! I was in the mood for some blue polishes (still in my blue period I guess), so today I've got 2 (kinda) colour coordinated manicures for you! 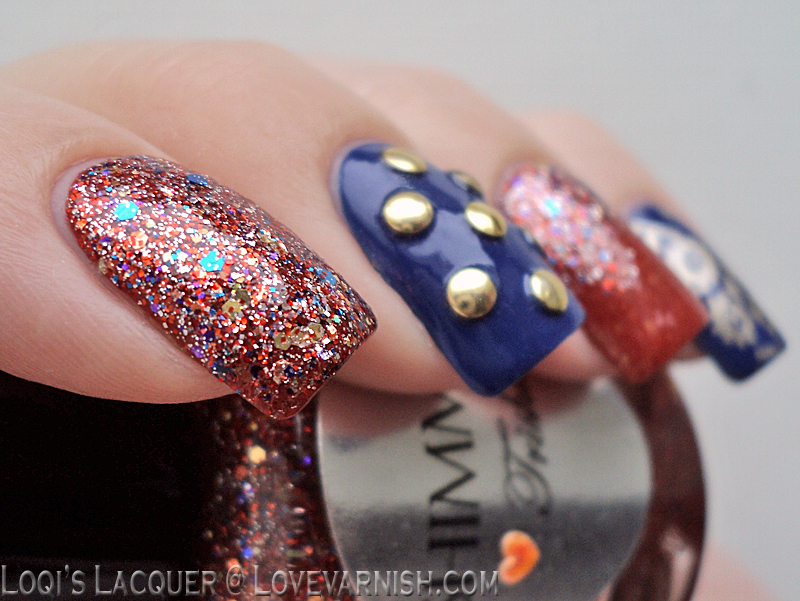 First up is a skittlette I did with Trisha, an orange mix with blue accents and second is a full manicure I did with Maria, a lovely blue glittermix. 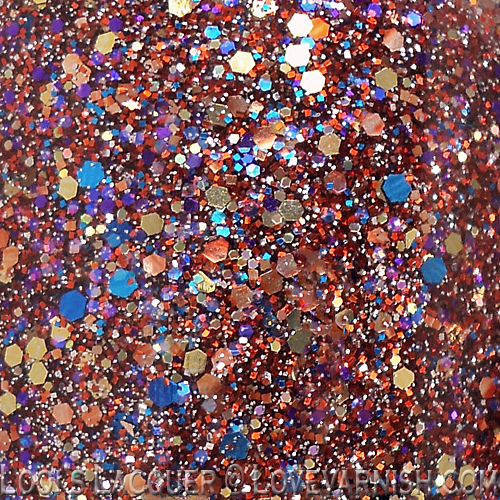 Trisha is an orange mix with tiny gold, orange/copper and purple glitter mixed with larger gold and blue glitter in a clear base. It's quite dense, and can probably be worn on it's own in 3 coats. Because I prefer layering glitter polishes however, I used Essence Gorgeous bling bling, as a base (this is quite a brown-ish orange, that's why I like it). I layered 2 coats of Trisha over my index fingers and thumbs and made a gradient on my ring fingers. 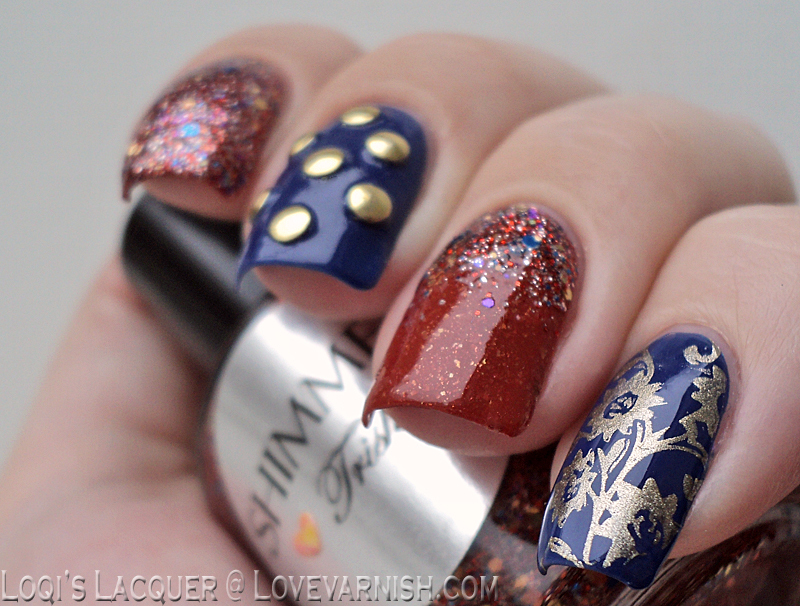 For my middle fingers and pinkies I used China glaze Manhunt to accentuate the blue in Trisha and I used gold studs to create a polka dot pattern and used China glaze Passion and MoYou plate Pro 08 to stamp my pinkies. 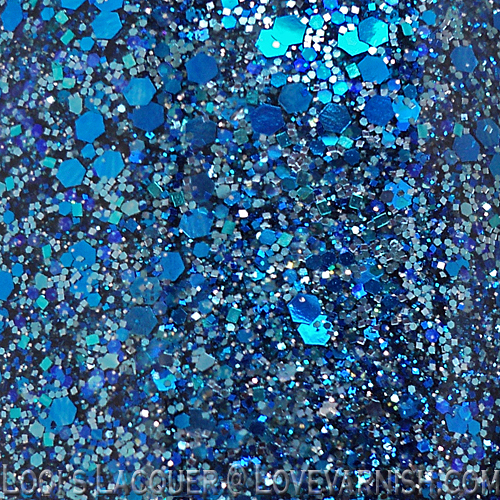 Maria is a gorgeous mix of different shades of blue in different sizes. This one also has a clear base, so again, I layered. This time I put 2 coats of Maria over a base of Sephora Curacao (a medium blue crème) which mached the larger blue glitter perfectly. There is not much else to say about this polish really. 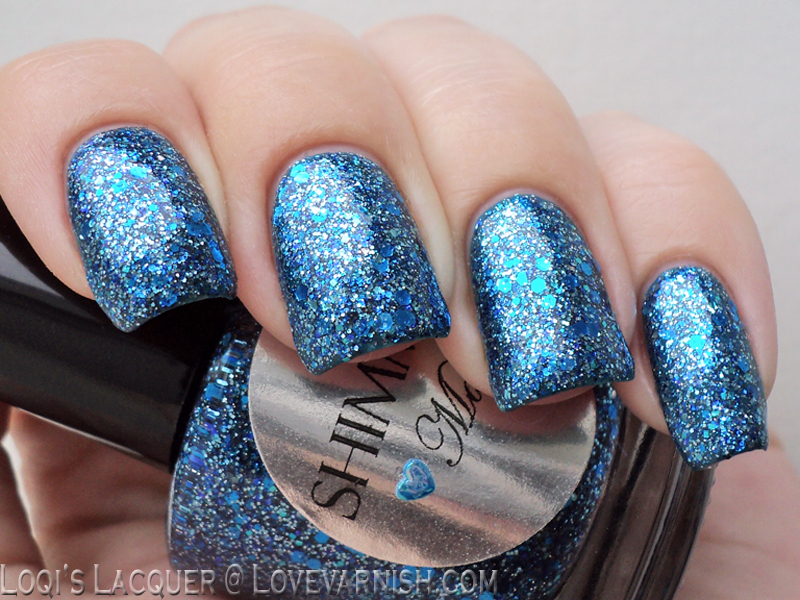 It's gorgeous, it applies just as great as every other Shimmer polish and I love it! 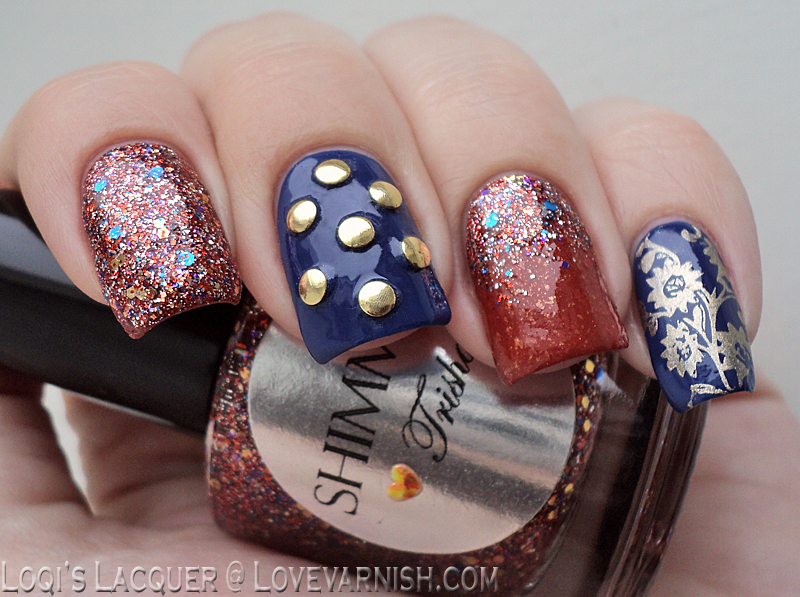 Love the first nail art! It'amazing! You are so creative! 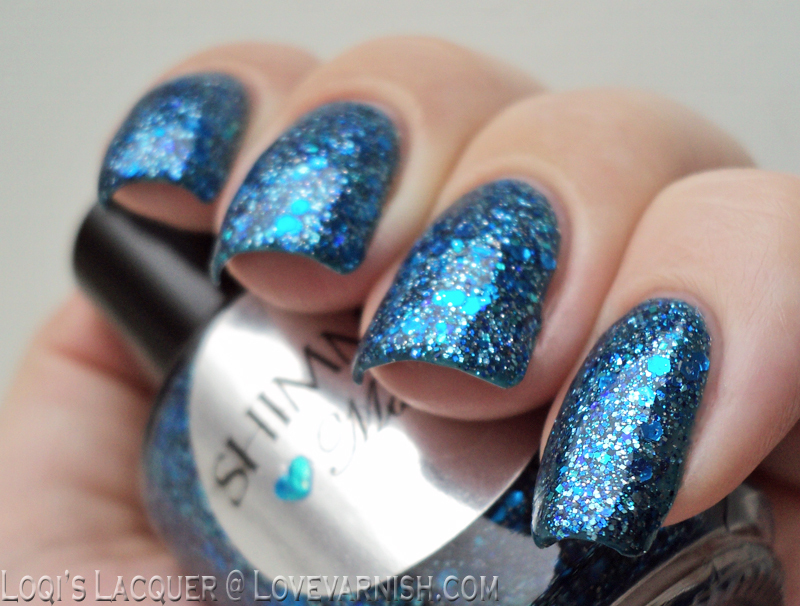 And the blue polish i beautifull! Tricia is pretty but Maria is beautiful! Maria is over the top gorgeous! The skittlette with Trisha looks great! :) I love the addition of the studs. that shade is SOOOOOO GORGEOUS! Gorgeous swatchessssss I'd forgotten how much I love Ruby Pumps! I think it'd look gorgeous on you too! Haha I know I asked! So no problem at all, I think there are plenty of people prefering square so I knew that when I shaped them ;-). That's what happens with these oldies - you get distracted by newer beauties and forget about them! I like seeing more rounded shapes, too. You are fortunate to be able to wear both! It is what I have to wear because my nails are too fragile for square. But in the fashion world, you almost never see sharp square nails. I also never see people in my real life with square nails. It seems to be a nail enthusiast "culture" thing, not standard.